We have had a very busy month. We started out with a check up. Reagan now weighs in at 14 lbs 12 oz and Claire is up to 12 lbs 2 ozs. Everything is fine developmentally and the doc gave the go ahead to have them start cereal. Our only concern at this point is still Reagan's head. Poor guy. First Steps came to evaluate him yesterday and we will soon learn if he needs services-physical therapy. He seems to have torticollis-probably from his sister sitting on him in the womb. Until that gets better, with stretches and exercises, his head won't get better. We will also go to Riley to see if he will need a special helmet to help it along. Cereal has been fun, well for Claire. She is eating like a champ! Opening her mouth wide and always ready for more. Big brother Reagan however is not that interested. He even clenches his mouth shut on occasion. We're not pushing him. He does have a slight cold right now so I'm hoping that has something to do with it. 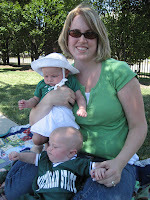 The kids got to go to their first baseball game last weekend when we joined the MSU alumni group for an outing at the Indianapolis Indians game. Too bad they lost horribly. It was wonderful weather though! Grandma left us yesterday to go back to Grandpa Wilmering. We will miss her. She had stayed with us for most of July and it was so fun to have her. Hopefully we can visit her soon. The babies will be taking their first airplane ride this Saturday. I'm taking them to Seattle to visit my aunt, uncle and cousins. The whole extended family is going, G & G Adams, Uncle Lance, cousins, and second cousins and Aunt Peggy and Uncle Jerry. Should be fun!